Saturday morning was a lovely, lazy, stay-in-bed kind of morning…for my husband. I was awake at seven, and while the bed was cozy and the freak heatwave had been replaced by typical October morning mist, I was restless and scrolling through the internet on my phone. I came across a post by my good (Facebook) friend, Martha Stewart. I was suddenly motivated enough to un-snuggle myself from my dude and get moving on flapping some jacks. Martha’s post featured 23 recipes for pancakes, but the one that jumped out at me was the orange-ricotta pancake. It looked incredible, and I knew I had all the ingredients. Bonus! What I actually made however, were the cottage cheese pancakes with lemon. Only, with ricotta, instead of cottage cheese. Also, I added the lemon zest directly into the batter. Ok, maybe I should have stayed in bed a little longer since I misread the recipe completely, but guess what. They were delicious, and nutritious. 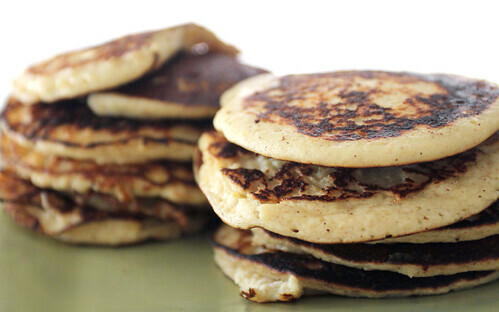 Here’s the recipe for the cottage cheese ricotta pancakes with lemon, just as I made them. 3. Spray griddle with cooking spray; heat until a drop of batter sizzles upon contact. Working in batches, pour 1/4 cup batter per pancake onto griddle; cook until surfaces bubble and edges are slightly dry, about 1 minute. Flip pancakes; cook until undersides are golden brown, about 3 minutes more. Divide confectioners’ sugar among pancakes. Serve sprinkled with lemon zest and with lemon wedges on the side. Note, I have been out of confectioners’ sugar for almost six months. These pancakes are yummy without it. Serve plain with a squirt of lemon, or with real maple syrup on the side. Happy accidents and happy tummies! Also, I decided to cut this recipe in half when I made it. We didn’t need 2 dozen pancakes, deliciously healthy or not! Thanks to Marthastewart.com for the inspiration.